There are free dervish shows every Friday. Konyans are annoyed that other cities have dervish shows, and what's really wrong with these other shows is that they also include belly-dancers and alcohol - blasphemy! Don't think those conservative burqas signify conservatism - if they want it, they'll bring it up. He adds that this town is known nationally as "Crazy Konya." He mentions with distaste that many Korean missionaries are sent to Konya to convert the Moslems to Christianity. He confirms that there are accommodations at Sultanhani, the Silk Road fort two-thirds the way to Aksaray, but says that the actual fort is worth perhaps a half-hour. I break away, wander back to the hotel, doze for an hour or so, and then head back outside to take my obligatory tourist photos. Outside the tomb of Mevlana I'm interrupted by someone who introduces himself, chats a bit, and then asks if I can help him with his English verbs. He asks if I will follow him two blocks to his cousin's pottery shop, so I can write down the verbs for him on a proper sheet of paper. If this is a way to get me into a shop, it's original. I have the time, so what the heck-I do it, spending about 40 minutes congregating verbs, before I break away. 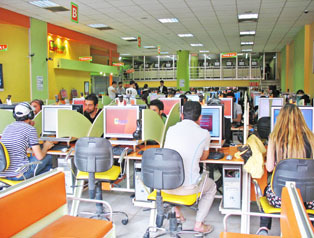 Some internet cafes are dark, hot and smoke-filled. But this one was a treat. ATMs are everywhere. 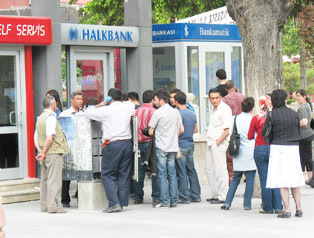 But be careful about running your funds down too low - sometimes the ATMs are out of cash.